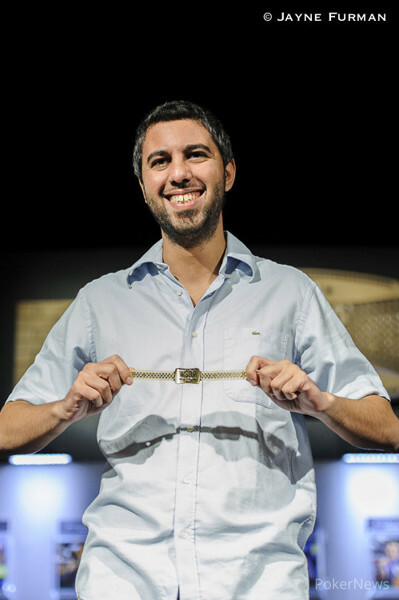 Ladies and gentlemen, the 55th event of the 2014 World Series of Poker has crowned its champion and that champion is none other than Asi Moshe, who is now the proud owner of a WSOP gold bracelet and a wallet-bursting $582,321 in prize money. The final day's play began with 17 players in contention for the title, but even before two hour-long levels were completed the final table of nine was reached. 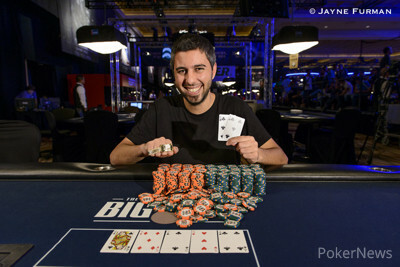 Bernado Dias was the first to fall and he was followed to the sidelines by Robert Allen, Nicholas Nowak, James Dorrance, David Quang, Paul Balzano, Jonathan Andero, and Georgios Kapalas, with the latter bursting the final table bubble. It took 43 hands of play at the final table for the first player to be eliminated, that unwanted title going to Brian Kennedy who ran his into Aaron Massey's and couldn't improve. One hand later, Tim West shoved all in with the and David Jackson called with the dominating and proceeded to flop trip aces to send the vocal West to the sidelines. Another 30 hands played out before the former November Nine member Marc-Etienne McLaughlin finally ran out of luck. McLaughlin had seen his stack yo-yo throughout te day and looked set to double with his when Massey called his all-in bet with the inferior . However, Massey spiked a queen on the turn and McLaughlin couldn't find an ace on the river and his tournament ended in seventh place. Sixth place went to Denmark's Henrik Hecklen, who three-bet over a Moshe raise with the and Moshe called with the . The five community cards were void of drama and the tournament was left with only five players, each guaranteed a six-figure payday. Five became four with the exit of Bobby Poe, who also fell victim to Massey. Massey raised, Poe three-bet all in with the and Massey called with the and then spiked a queen on the river to send Poe home in fifth place. Next to fall was the start-of-day chip leader David Jackson in somewhat of a cooler spot. Jackson and Moshe had battled a few times during the final table, but the following hand would be the last time they would do that. Moshe raised to 100,000 from the button and Jackson three-bet to 360,000 from the small blind. Massey called from the big blind and Moshe four-bet to 955,000. Jackson thought for a moment and then moved all in for 2,855,000. After Massey folded, Moshe quickly called and tabled the versus the of Jackson. The board ran out and Moshe made a huge double up as he had Jackson covered by just 50,000. 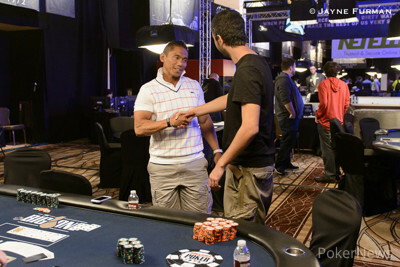 Jackson graciously shook hands with his former table mates and exited the tournament area. Moshe then sent the popular and well-supported Massey to the rail, again in a hand that essentially played itself. Moshe raised, Massey three-bet and then called Moshe's shove. Massey turned over the and was in bad shape against the of his opponent. Massey flopped a set, but so did Moshe and when the turn and river bricked off, it was game over for Massey. Heads-up play lasted for six hands with the final hand being the 180th of the final table. Ferrer raised to 330,000 and Asi Moshe made the call. The flop was and Moshe checked. Ferrer bet 320,000 and Moshe called. The came on the turn and Moshe check-called a bet of 540,000 from Ferrer. The river was the and Moshe led for 1,750,000. Ferrer moved all in and Moshe snap-called. Ferrer tabled the for the wheel, but Moshe tabled for the higher straight and Ferrer exited in second place. So there you have it, Asi Moshe is the latest poker player to win the most sought after piece of poker jewelry and will be forever remembered in the WSOP's history books. Hand #180: Michael Ferrer raised to 330,000 and Asi Moshe made the call. The flop was and Moshe checked. Ferrer bet 320,000 and Moshe called. The came on the turn and Moshe check-called a bet of 540,000 from Ferrer. The river was the and Moshe led for 1,750,000. Ferrer moved all in and Moshe snap-called. 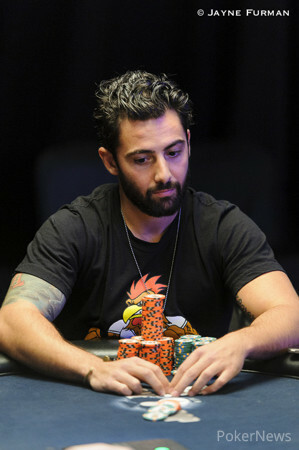 Ferrer tabled for the wheel, but Moshe tabled for the higher straight and Ferrer exited in second place. Hand #176: Michael Ferrer called and Asi Moshe checked his option. The flop was and both players checked. The turn was the , Moshe led for 85,000 and Ferrer folded. Hand #177: Moshe raised to 170,000, Ferrer three-bet to 590,000 and Moshe folded. Hand #178: Ferrer raised to 370,000 and Moshe folded. Hand #179: Moshe raised to 170,000 and Ferrer called. The flop was and Ferrer checked. Moshe bet 240,000 and Ferrer folded. Hand #174: Michael Ferrer raised to 225,000 and Asi Moshe called. Moshe checked the flop and folded to Ferrer's 315,000 bet. Hand #175: Moshe raised to 170,000 on the button and called when Ferrer raised to 485,000. Ferrer check-called a 500,000 bet on the flop and a 750,000 bet on the turn. Both players checked the river and Ferrer won with his . Hand #173: Asi Moshe raised to 200,000 from the small blind and Aaron Massey responded with a three-bet to 555,000. Moshe moved all-in and Massey called. Both players flopped a set on the board but Massey was still behind and stayed there, busting in third place for over a quarter of a million dollars. Hand #171: Aaron Massey raised to 185,000 from the small blind and won the pot. Hand #172: Massey raised to 160,000 from the button and Asi Moshe called from the big blind. The players checked the flop and Moshe checked the . When Massey bet 170,000, Moshe folded. Hand #166: Michael Ferrer called from the small blind, Asin Moshe raised to 275,000 and Ferrer folded. Hand #167: Asi Moshe opened to 200,000 from the small blind and Aaron Massey made the call. The flop was , Moshe led for 225,000 and Massey folded. Hand #168: Asi Moshe raised to 170,000 and both opponents folded. Hand #169: Aaron Massey raised to 170,000 and Michael Ferrer made the call. The flop was and Ferrer checked. Massey bet 195,000 and Ferrer called. The turn was the and both players checked. The river brought two more checks and Massey mucked after Ferrer tabled . Hand #170: Asi Moshe opened to 200,000 from the small blind and Massey called. The flop was and Moshe bet 200,000. Massey called and the turn was the . Both players checked and the fell on the river. Moshe bet 250,000 and Massey folded. Hand #161: Asi Moshe raised to 160,000 in the small blind, Aaron Massey called and the dealer spread the flop. Moshe bet 155,000 and Massey raised to 400,000. Moshe called. The turn was the and Moshe checked. Massey bet 575,000 and Moshe folded. Hand #162: Moshe opened to 165,000 on the button and won the blinds and antes. Hand #163: Moshe received a walk. Hand #164: Michael Ferrer raised to 200,000 on the button and both blinds folded. Hand #165: Moshe raised to 165,000 and Massey called. Both players checked down the board, Massey winning with his . Hand #152: Asi Moshe opened to 150,000 from the small blind and Aaron Massey folded. Hand #153: Aaron Massey called from the small blind and Michael Ferrer checked his option. The flop was , Massey bet 80,000 and Ferrer folded. Hand #154: Asi Moshe received a walk. Hand #155: Aaron Massey received a walk. Hand #156: Asi Moshe rasied to 130,000 and both opponents folded. Hand #157: Aaron Massey raised to 130,000, but folded to Asi Moshe's 340,000 three-bet. Hand #158: Asi Moshe opened to 200,000 from the small blind and Aaron Massey three-bet to 475,000; Moshe folded. Hand #159: Asi Moshi raised to 170,000 and both opponents folded. Hand #160: Aaron Massey raised to 160,000 and both opponents folded.